South Carolina Woman’s Missionary Union (WMU) began missions education camping in 1925. Camp was held on various college campuses. Leaders recognized that a permanent camp site dedicated to missions education camping was needed. In 1941, W. C. Rawls loaned South Carolina WMU a 50-acre site located eight miles from Wagener in Aiken County as long as the land was used for a camp. The land fronted Cedar Lake. WMU named the camp in honor of the donor. Because of the war, procuring materials and supplies was difficult. Construction began in February 1942 with the first camp held in June 1942. That summer camp was very rustic with no hot water in the bathhouses. It was crowded and buildings were used for several functions. Even with the hardships it was “their camp” and they were so proud. 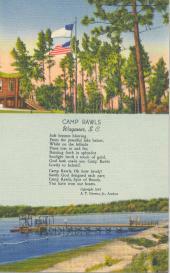 Many WMU conferences, Sunbeam, GA, and RA camps were held at Camp Rawls. It served WMU well from 1942-1982. In 1982, WMU closed Camp Rawls, selling all the buildings to help build their new camp, Camp La Vida in White Oak, SC. The land reverted back to the Rawls family per the agreement.